Mon/Tues is sold out but that's due to World Series. Dodger Stadium is closer to BUR than LAX. It should not be a hard flight to fill. Its closer to Hollywood and has direct rail connection to Downtown LA. I’m not sure whether this is the first appearance of it, but El Al is sending the 777 to Boston with an arrival time of around 0500 tomorrow morning. So folks, i found a great new table on the DOT stats site, it's an on-time performance database, but unlike it's predecessor, it actually shows the regionals as well as the mainline carrier information. 1. Data only from Jan 2018, no previous comparatives at the regional carrier level available, although total carrier level is available for prior years i have ignored this for the purposes of the exercise. 2. Domestic, PR and USVI only, no international data available. 6. As this is the BOS thread. only BOS routes are included. To do much more is beyond the power of my computing, 7 months alone provided me with 176,000 rows of data, to pull MA, I removed anything not related to BOS, although for B6, I do have the figures for ORH, but not included in the final file. 7. For this version, i have done a Month (July) and YTD (Jan to July), I may add more if i have time in terms of rolling months and trends, but not yet. a) Bidirectional data of number of flights, cancellations and diverts, showing a net completion # and % along with a rough average stage length, grand totals attempt to be weighted average, still working through that. b) Average Elapsed Time is total flight time including air and ground, separated by air and ground underneath. Ground time is effectively a combination of Taxi Time out (departure) and Taxi Time in (arrival) at the relevant airports. c) # of aircraft used: this is quite awesome information, although i wish it was just a little more detailed, basically this table has "tail reg" information, so i can actually count how many aircraft are used by each carrier. I can actually dive into how many on a particular route if needed, but i do not have aircraft types or load factors in these tables, so please do not ask if i do!. However what I DO have is which aircraft are used on which route on a given day and by flight number, and times if you are interested, please ask. I also have the detailed tables for each airline, but be warned they are big, so it's unlikely i can send them directly to you. IMPORTANT NOTE: This is OUTBOUND from BOS only information, so it's not the same as section 1. # of flights, cancellations and diversions for a % completion factor, # of departures per day is based on the the gross number not the net and remember does NOT include international, so complaining that DL are at 115 for example and the data is wrong, is incorrect, because as noted, it's domestic only.. sorry. This is On Time Performance, so net of cancellations, how many were delayed out of BOS, On-time as defined by DOT is leaving less than 15 minutes late, % OTP to see who is doing better than others. The departures per day shows how many flights are getting off the ground as opposed to section 2, which is how many are supposed to each day. I'm still getting to grips with this section, however basically a breakout of the key delay factors reported by this table i am working with. Carrier Delay is delays caused by non-aircraft carrier activities, Weather and ATC are obvious, then there is Inbound aircraft delay as well. ALSO OUTBOUND from BOS info. 12 = 180+, no limit, others are blocked by 15 minute intervals. Highest and Lowest in each secition, for those with multi-carriers, i have split those out on separate tabs for viewing. So what I think is that you're an incredible contributor to our little BOS forum. I don't post often, but I'm an avid reader, especially of your posts. We all owe you huge thanks for all your hard work to keep us BOS-geeks informed. You're awesome. I start to wonder if Logan needs a massive road overhaul in addition to the building of gates and new terminal space. I was riding the bus from economy parking last Friday afternoon and the roads were a complete gridlock. Whoever decided that I-90 and 1A need to cross and interweave with airport roads was a complete idiot. Unknown, I just went on flightradar24 and it appears at least for the next two days it is scheduled as A346. Maybe it has something to do with the broken A380 that went technical, but that would be just speculation. I booked BOS-FRA back in March specifically to ride the 748, but back in May or June, I believe, I noticed the aircraft swap so it was def planned a while ago. Wonder where those 2 748s will go from BOS & JFK. Dupe post - pls delete mods! Curious where they’re going also. Looks like LAX & MIA swapped planes. As disappointed as I am to miss out on the 748, the whole reason I booked this specific flight, I have not had a ride on any A340, so getting the A346 is a nice consolation prize. I post sometimes ... but mostly a follower of everything Logan ... and the small community of the dedicated contributors ... you're all awesome!!! Also - BOS-PSP was bumped to 4 weekly now by B6 in OAG thread. Looks to be 1457 service. KE supposed is three weekly for W19-20. I have a feeling that will be bumped. Neat to see SY do LAS-BOS. I wonder if they will ever try a Caribbean/Mexican route from BOS. They have done charters in the past. Thank you guys... it's only worth doing if it's providing good info... some of those numbers, particularly the aircraft counts were scary in size, given the size of some of the operations being reviewed. My next task, which is hard due to the time lag on the reporting, is to analyze how the new routes are going. In support of that I have pulled a list (from airlineroute.net) , of new routes started in the last year and the ones announced for 2019 already. I did not pick up SY on BOS-LAS yet, as it hasn't formally shown up. These also do not include increases in frequency and ones announced that aren't happening (think PF). If I have missed any, please let me know. I also want to send a personal shout out to tphuang, who makes some of my stats look poor with his yield analysis work.. keeps me on my toes for sure, and I love seeing his posts. Interesting enough it shows my FRA-CPH flight being on a NEO on the timetable while on LH.com it still shows an A319. Would be nice to check the NEO off! thanks for the shout out VS4Ever. Really appreciate all the great work you do here. ok, well it's pretty clear from these numbers, that it's not new routes that are driving specific growth.. albeit there are a number to begin later in the year. Based on this. IB/Level/IAG have to be happy with the early numbers out of BCN, B6 should be happy with SYR given it's a RON flight and just an extra use of a plane each night and i have to say B6 should be happy with the pass counts to MSP on that service. NK are a little underwhelming on their MSY flight and the newbies 3M and 4B (Silver and Boutique) for their type of service are not terrible. But let's put this into perspective. DL announced a couple of routes and never really started them or reported them, not 100% sure which. (CHS and SAV) on a pure route basis, there were 174K from the new routes, against a total domestic uplift of 1.3m, for about a 14% number, there will obviously be some connecting going on, but no way to know how much sadly. So here's the file, check it out. Thanks to you both and to all the other contributors here - I learn a ton from this folder and it's nice to be able to have an AvGeek discussion using facts and analysis while avoiding the histrionics in some of the other folders on this board. Thanks again! I wonder what LH did to get all the passengers to NYC? United to Newark? Edit - nevermind - I realized that the plane was departing JFK to FRA. Still, I wonder how they were able to reacommodate all the 380 passengers to FRA? I doubt there's much spare capacity in the BOS-FRA flight. As someone who's been caught in a similar situation a few times before (as I'm sure lots af you have too), I suspect the majority was sent to a hotel for the night and then put on a variety of other options to their final destinations the next day, not necessarily via FRA. I wonder if any pax were lucky enough to make it onto the LX flight to ZRH that same night. The options that late at night to get to Europe and beyond on such short notice, are few. Some pax might have been able to make it onto the BA flight via LHR. I was playing around with some dummy bookings for BOS-ICN. KE seems to be confident in their ability to get some decent fares. Other than a few days at the start in April where fares are 14-1500, most coach travel is between 1800-2200 for everything loaded through next summer, and business is between 6600-7300. Compare this to NYC, which has competition from Asiana, BOS is commanding a premium by a not insignficant amount. I know it's very far in advance and we'll have to see how things go if things get closer, but if Cathay / JAL etc... are any indication, KE will do well on the route. I'm surprised they are tentatively planning to do only 3 weekly in winter. Me, too. It's not as though they're trying to fill a 747 or a 77W. And besides, business travelers don't make a distinction between 'summer' and 'winter' like leisure folks do. A couple of articles reviewing their first A350 have mentioned Boston as starting next year (no specific date though). Supposedly they want to do it as a "Panda Route" similar to EVAs Hello Kitty flights but with Pandas. I think the delay might have something to do with aircraft availability/familiarization, right now they only have 1 A350 and they're flying it between CTU and PEK. Likewise. Maybe it’s aircraft limitation? Is KE still receiving 787s? So far KE has received 8 of the 10 they ordered. So they only have 2 more coming into their fleet. Although they do have options for 10 more if necessary. Does anyone know how well the KE flights work for connections at ICN? I've gone through that airport a couple of times and it's a great place to connect. A lot of information about the upcoming Terminal B to C connector as well as the Terminal C canopy and all of the roadway upgrades Massport will be making. Massport has a number of project either under construction, or firmed up and set to start construction in the next 6-9 months. Terminal B expansion, Terminal E expansion, Terminal C to B connector, Terminal C canopy, Terminal B and C roadway upgrades. A lot on the plate for the next 3 years. It will be interesting to see what else Massport has on their long term radar - probably won't be until 2020 or 2021 before we start hearing some rumblings. ATC towers are usually FAA facilities so Massport wouldn’t play a part in it. That's correct. Towers are FAA, however it's worth noting that many of massports offices are located in the tower. Also have to bear in mind that in airport timing, 2022 is considered "soon"
That tower is a staple of BOS, would be sad to see it go. I believe this is referring to the old tower where a majority of Massports offices are at the airside. It’s part of the reconstruction of the B-C connector as it’s supposed to be torn down due to its age. I might be wrong (if I am, sorry) but that’s what I’m reading from this and the PDF’s of the B-C connector. The proposed new Terminal C canopy looks so much better than the current one. All that natural light would make a big difference in the feeling of the dropoff space. I agree, certainly does, feels very claustrophobic when you drive in there normally, I think the roadway is still a big issue, second biggest terminal in terms of gates with by far the smallest drop off area, when you consider what A and B have and E for that matter. Last couple of times we have actually gone to the arrivals in the morning instead to avoid the craziness. So much better. The roadway is definitely an issue - Terms A and B have much more space for drop offs and pick ups and you don't run into the traffic issues that you do at C. At peak times, C backs up onto the airport roadway. I like the canopy a lot. Maybe the ATC tower architect will have a nostalgic pang and keep the two leg design, but my memory of recent new ATC towers is that they're mostly giong to the single leg approach. Massport is adressing a lot of the roadway issues with the upcoming project. 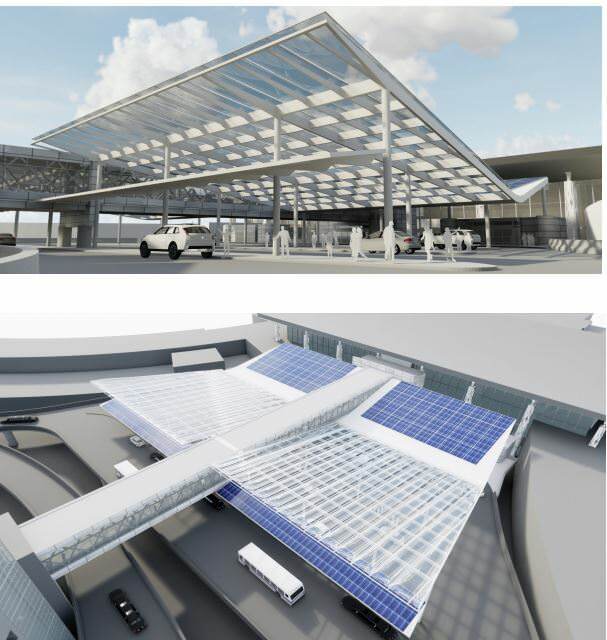 It should go a long way to improving the flow of traffic and drop off/pick up at Terminal C. The Terminal B to C connector also looks like it will be a great project - it's adding a pretty large amount of terminal space and will drastically improve the area in its current state. I have a few questions about possible Term. A expansion. Please bear with me, I haven't been there in awhile, and forgive me If posted earlier. 1 Are all those cargo areas at the end of A in use ? 2 If they are, can they be relocated somewhere else on the property ? Please answer objectively. I am just trying to understand if there is room for DL.to expand their operations in the future. Thanks in advance. I am looking forward to hearing from all you BOS posters. One of my favorite threads. Looking at the map I wonder about moving that cargo area to the area around the ends of 4R and 32 and creating an underground tunnel for the trucks to access it. That would make way for huge pax expansion possibilities. someone who knows more than me feel free to shoot this down.